We arranged a car from Le Meridien, Chiang Rai to Chiang Khong (thailand border) to depart at 6:30am. This allowed for us to arrive at the border at 8:00am, as required by the cruise. When we arrived at the border we checked in and were greeted by the first of many Luang Say Cruise team members. We were given the paperwork required to obtain our visas upon arrival and were guided to the windows where they process visas. We filled out our paperwork, handed it, along with our passports, through immigration at the Thailand border. We had to purchase a bus ticket from the Thailand Border to the Laos Boarder, which was 25 baht per person (less than $1). When we got off of the bus we had to get our visas for Laos. We handed our passports and paperwork to the tender at window one and waited for the visas to be ready. After about five minutes, window number two opened and our visas were complete. The process was painless and fluid. Next, the team member led us to the customs checkpoint where we presented our visas. Finally, we boarded air conditioned vans for the 20 minute ride to the river. When we arrived, we were directed to our boat. The boat we were brought to looked the nicest out of all of the other ones parked in the docks. The front of the boat had a bench to relax on during the cruise. The center of the boat had tables and chairs as well as the bar. The back of the boat, where we staked our camp, was a U-shaped, leather cushioned area with a coffee table. We relaxed in the back with some of our own music throughout the entire first day. We were welcomed with baskets of banana chips followed by cookies and the most moist and incredible banana bread we have ever had (sorry Debbie and Wendy). The first day we made a total of three stops. The first one was to pay a tariff once we crossed into a different province in Laos along the river. After this stop we were served lunch. There was a beef dish, fish cooked in banana leaves, steamed vegetables, and sausage with fresh tomato sauce. Everything was served with fried rice, which was amazing. We really enjoyed the traditional Laos food and were excited for what else we would be having throughout our adventures on the Luang Say cruise. Throughout the cruise we saw many different animals bathing in the river as well as fishermen and the daring others who decided to take the fast boats down the river. They are so dangerous that many people wear biking helmets…not for us! The second stop was at a small village. The people who live in this village are part of one of three different tribes of people in Laos. They use to live in a different part of Laos, but were asked to relocate when the new president was elected. This resulted in them having more access to clean water and better housing, as the government provides assistance with this to many of the communities. These village people live a very simple life. Their houses are built of wood or bamboo, they do not have air conditioning. We saw a few satellite dishes, so we think some may have television and internet. The children of the village were very friendly and loved to pose for photos. The older members were not so keen of us walking around and photographing their village. It was definitely at great experience and we learned a lot about the traditional lives of Lao people, however I felt that we imposed a lot on their privacy. The last stop we made was at the Luang Say Lodge, where we spent the night. In the morning we woke up and had breakfast at 7:00am. The breakfast was more of a western theme with eggs, sausage, bacon and toast. They did offer a few Laos style options such as caramel creme (similar to flan), mango, guava, and sweet sticky rice with beans. Everything was very good, we were really impressed. After breakfast, we enjoyed the view from the lounge chairs overlooking the Mekong River. Next, we boarded the boat and were cruising by 8:15am. We cruised down the Mekong for about 2 hours to our first stop. This stop was at another village, but this one was a little different. This village makes hand made scarves that are used to generate income for the village. The people in this village are buddhist and there was a temple there as well. The streets of the village were lined with women selling their scarves, some hand made and some imported from china. If you are looking to support one of the families in the village, buying a scarf from them is a great way. However, make sure you buy one that is locally made and not imported, as this defeats the purpose. After walking around and seeing how they made the scarves and lived, we headed back to the boat. It was time for our last lunch on the river. We had a selection of Laos cuisine including Chicken Curry, marinated pan fried pork and steamed veggies, served with rice of course! The chicken was great, although I wish it had been a bit more spicy. The veggies and rice were also cooked nicely and the pork had great flavor. After lunch and a bit more cruising, we stopped at caves to explore. The lower caves are well lit, while the upper caves require a flashlight in order to see anything and get around. 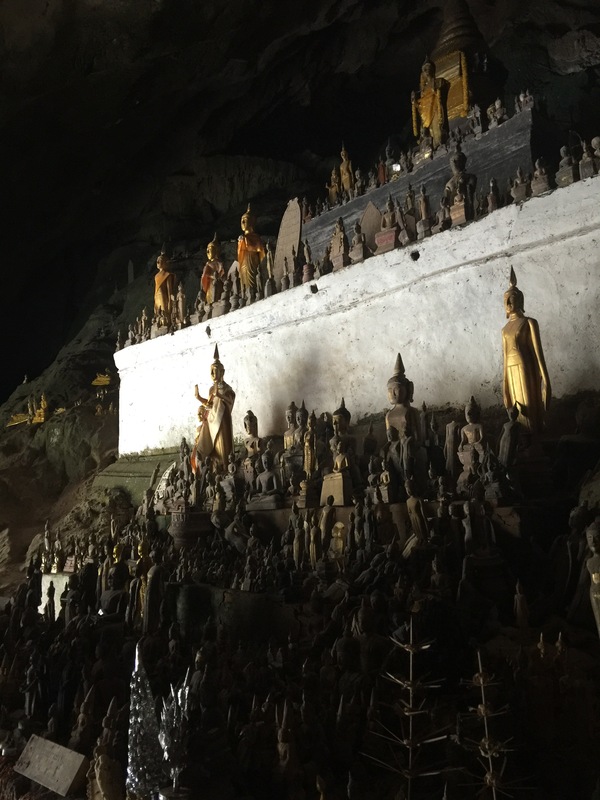 Inside of the lower cave were many buddhas that have been left there by people coming to pray. The upper caves housed the another large buddha and many small ones as well. There were some old drawings and scriptures on the walls, but we were unable to make out what many of them were since they are very faded. It was definitely worth the 350 stairs to climb to the upper cave. 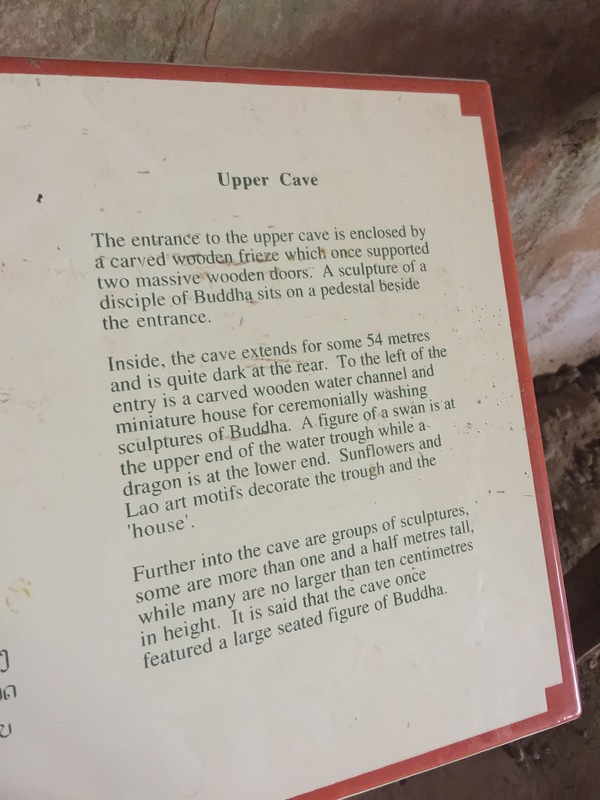 Not only for the experience of seeing the architecture and buddha, but also because the cave was cold and allowed for us to cool down a bit. After the caves we were on to our final destination: Luang Prabang, Laos. We had an amazing trip on the mekong river with Luang Say Cruise and our guide was also great. We were very excited to arrive in Luang Prabang and looking forward to a great next few days in this UNESCO World Heritage Site.